Thomas Jane (Hung, The Mist) uploaded a photo to his blog yesterday with the caption “How I spent my b-day.” What’s the image? Well, it includes the actor on the set of his latest thriller – Red Machine – with one giant, hirsute co-star…and we’re not talking about Billy Bob Thornton. 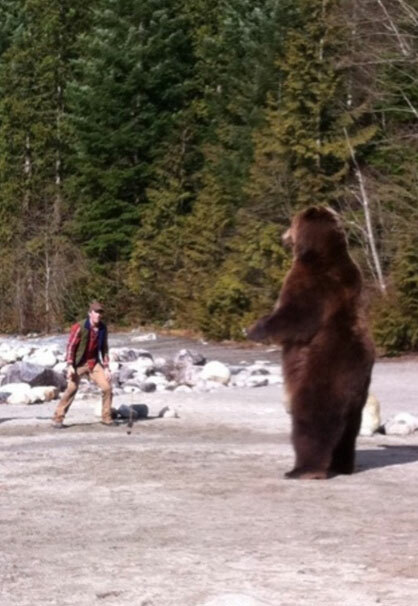 Here is Jane getting acquainted with the film’s co-star, Bart the bear. The two are currently up in Canada, where Red Machine is shooting for director David Hackl (Saw 5). Bart was flown in from California. I already applaud this production because it is eschewing CGI and is said to be utilizing a real Grizzly. The film is the story of two couples who venture into the wild and are pursued by an unrelenting bear. James Marsden, Piper Perabo, Jane, Billy Bob Thornton, Scott Glenn, Kelly Curran, Michaela McManus and Adam Beach star.